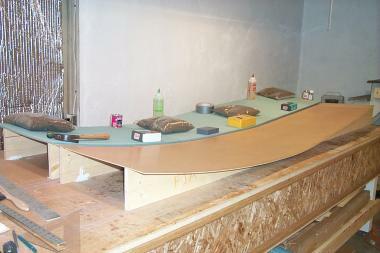 This covers the molding of the fuselage sides. 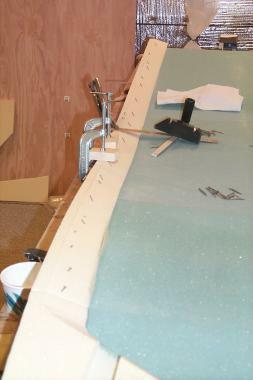 Jigs are attached to the table then masonite is layed on top and nailed in place. 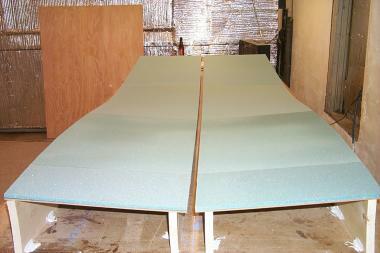 The fuselage sides foam is then attached to the masonite. 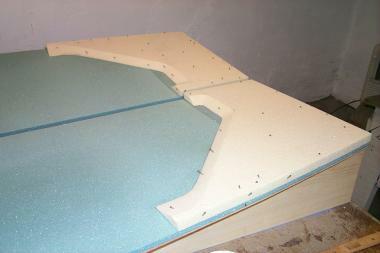 Foam spacers are applied around the perimeter of the sides to give it some depth. NOTE: Important lesson learned - When adding the 3/4" foam spacers make sure that they overhang the forward and aft ends of the 3/8" foam by at least 1/4". I made my spacers flush with the end but the slope makes the foam come up a bit short later when cutting the sides to length. NOTE 2: Cut the bottom edge of the 3/8" foam a bit long. 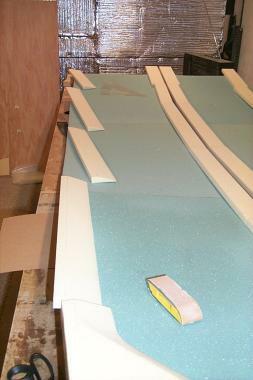 Later you will glue the lower longeron into the proper position and you can trim the excess foam. I didn't do this and ran into some problems in chapter 7. February 2, 2000. 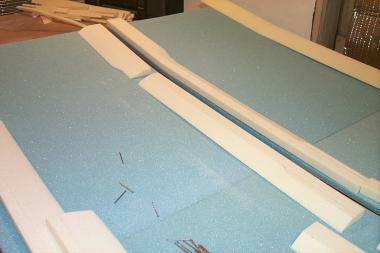 Each fuselage side is made from four pieces of 3/8" foam. I used the hinge method talked about in the archives to join the foam pieces together. February 2, 2000. Here are all the fuselage jigs bondoed into place. A few chalk lines are used to line everything up. I only bondoed on one side of each jig. After a good drying period and nailing the masonite on top it all seems steady enough. Time will tell (it was). February 3, 2000. 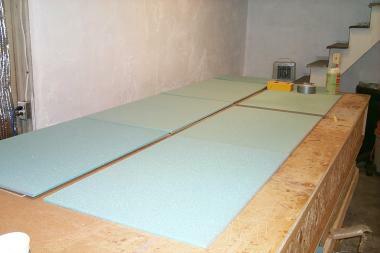 The process of attaching the foam to the masonite jigs. A bunch of small dabs of 5 minute epoxy are used along with a lot of weights. As it turned out I should've used more dabs in the center. I had enough around the perimeter but not enough in the center. All should be all right though. February 3, 2000. 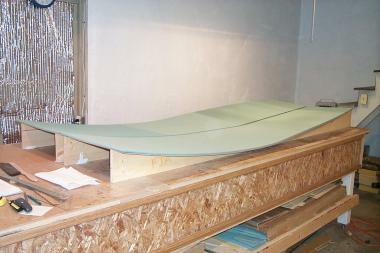 Here are both fuselage sides ready for contouring. February 3, 2000. 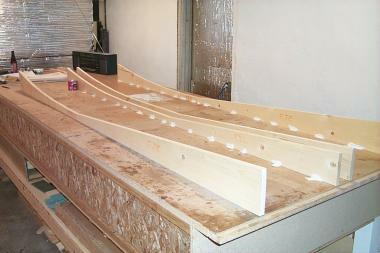 Another view of the fuselage sides in the jigs. February 13, 2000. The aft portion of the spacer. This was cut from one solid piece using a utility knife. All the dimensions were marked with a felt tip pen using the drawings in the plans. The main dimension missing in the plans is the slope of the diagonal beveled edge. I chose to make it the same as the top edge (cross section C-C). To make the beveled edge I used a hacksaw blade to rough cut the bevel. I then sanded the cut with 120 grit using a scrap of 2x4. I simply sanded to the line drawn on the foam. Make sure you use a mask when doing this. 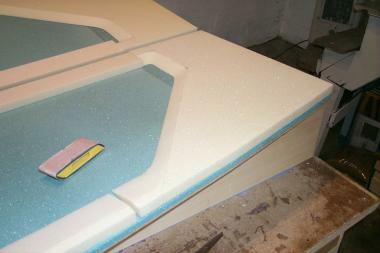 Sanding this foam makes a lot of nasty foam dust. I even suggest wearing goggles too. I didn't at first and found out how painful foam dust in the eye can be. February 15, 2000. The rest of the bottom edge spacers. I cut 2' long strips at 3" widths. I then used the hacksaw blade and sandpaper to make the bevels. February 15, 2000. The top edge spacers are similar to the bottom edge. The forward most piece has the transition from 3" wide to 2.5" wide 10.5" from the front edge. The next piece is 2.5" wide but the bevel changes 30" from the front edge. If you look real close you can see the subtle bevel change about a 1/3rd of the way up from the aft end of the second piece. February 16, 2000. Here are the two aft pieces microed in place. I used lots of nails to hold it in place. I put slurry on both the spacer and the fuselage side. I then put a strip of wet micro on the spacer then put it in place. I slid the spacer around to spread the micro until it reached the edges. At this point you may notice I forgot to cut the electrical channel. When I cut this foam out I remebered I wanted to check the archives to see if there was an issue with the location of the channel. I forgot and just glued them in. No real harm. It will be easy enough to cut them later. February 17, 2000. Here are all the bottom spacers microed into place on the right fuselage side. The nails worked fine for the curve at the bottom but I needed some clamps to hold a piece down onto the curve near jigs FJB and FJE. February 17, 2000. 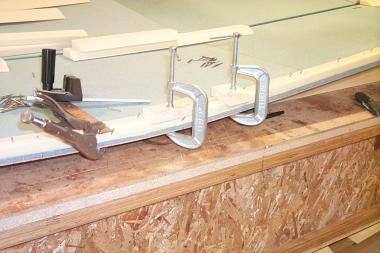 Clamps holding the spacer onto the fuselage side near the ends of jig FJB.